... in other words, spicy pork pies :-) The empadinhas are a great favourite of Brazilians, and the Portuguese. The Goan population have made many Portuguese dishes thier own, the vindaloos, the caldieradas are a good example of the way they have adapted them to suit their tastes. This is my version of the classic Goan empadinha. I love making them, and the contrast between the buttery puff pastry and the spicy pork filling is an absolute delight. I make it with puff pastry, just because I can then cheat and use premade pastry, but you can use shortcrust as well, to make a more traditional pie. You can make the pies big or small, depending on what you're making them for. They would taste awesome as little canapes for a dinner party, or you can make them a decent size for a family meal. Play around with the spice combinations until you find a level of spice that suits you. The combination I make is not super spicy, and should suit Western tastes, but again, only you can know what level of spice suits you. 1. 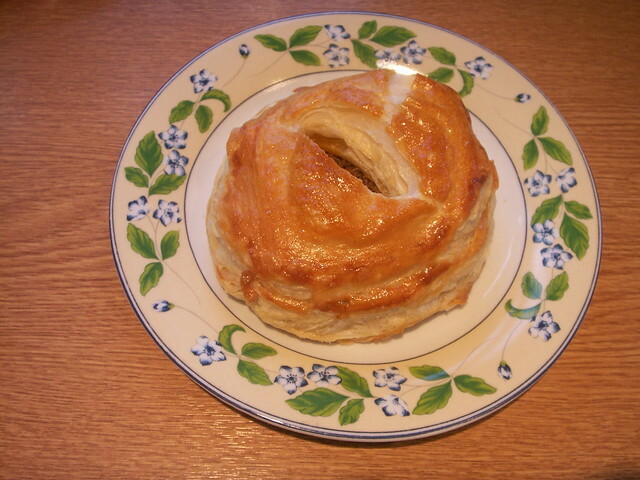 If you are using the premade puff pastry, cut into 5 even sizes. Using a generous amount of flour to dust, roll out each piece of pastry, and cut out 2 circles. 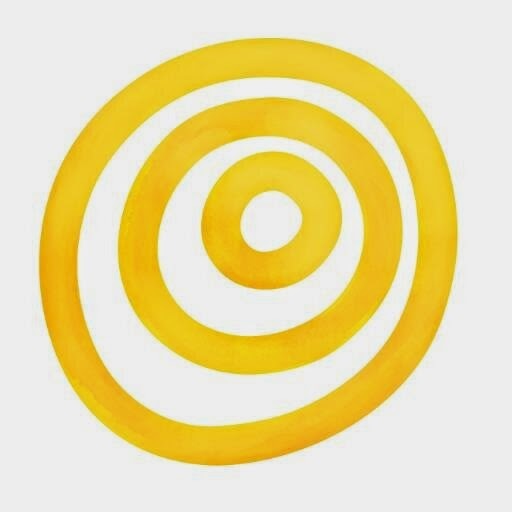 You should have 10 circles. 2. In a blender, grind the red and green chillies, garlic, ginger, turmeric, cumin, cloves, cinnamon, peppercorns, tamarind or vinegar using just enough water to make a fine paste. 3. Heat the oil in a pan, and fry the diced onion, until its soft and golden brown. Do not burn the onion, so keep a sharp eye out. 4. To the fried onion, add the blended paste. Fry well for about 6 - 9 minutes on a medium heat, until the masala comes together in a sticky mass, and the oil starts to separate from it. Its really important that you do this, as otherwise the spices will still be raw and hit the back of your throat. 5. To the fried masala, add the pork, and stir-fry for 5 - 8 minutes on a medium to high heat until the pork is cooked through. Now add the sugar and salt. Taste and adjust the seasoning. It has to be spicy, fragrant, and with a slight tart bite to it. You may need to add more tamarind or vinegar to the mixture, depending on the taste. 6. Cook the pork mixture, until its just moist enough that when you roll the mixture into a ball it should just about stick together. Cool the m ixture thoroughly. This pork filling can be made in advance, and kept in the fridge overnight. 7. Now, roll a handful (about the size of a tennis ball, smaller if you're making bite sized pastry) of the mixture into a loose ball, and place in the middle of a pastry circle. 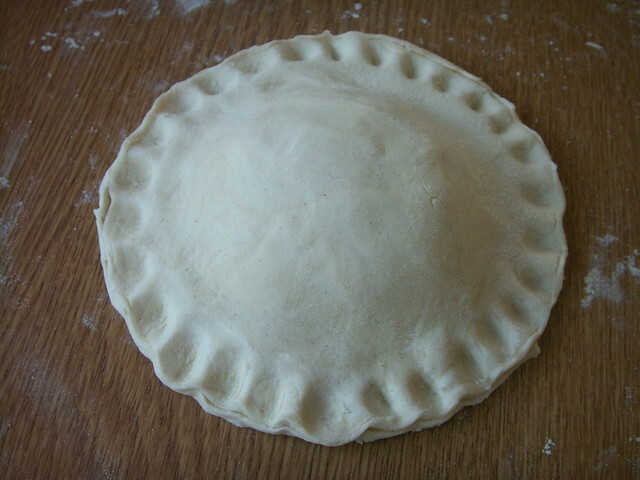 Brush some egg mixture around the pastry, and cover with the second circle. Press the edges togather, making sure that they have sealed completely. Using the tip of your index finger or a fork, press in a decorative edge. Brush the whole pie with the egg wash.
8. Preheat the oven to 175 C, placing a baking tray or sheet in it. 9. Place the prepared pies carefully on a preheated baking tray. 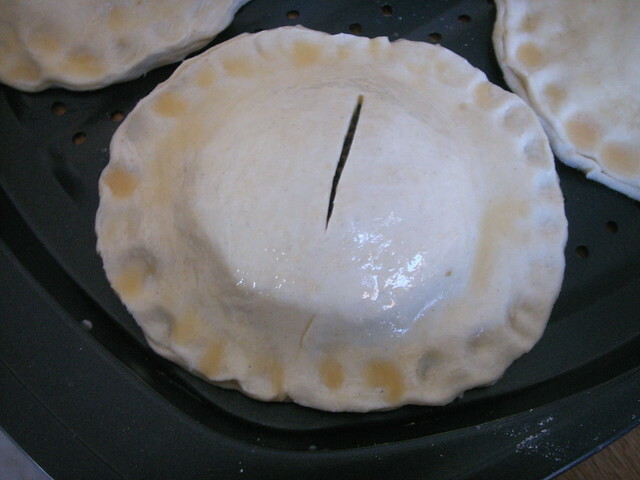 Cut into the top of the pie with a sharp knife to let the steam escape. 10. Bake for about 45 minutes or so until the pastry is well risen, golden and crisp. Serve warm or cold. PS - Make sure that the pork mixture is completely cold before filling the pie. I made the mistake of trying to stuff hot pork into the pastry and ended up with a soggy mess that had to be thrown away. Great dish. Those Empadinhas look fantastic and I definitely will try them out. Thanks for sharing this great recipe. Being somewhat used to Restaurant dishes and description I would hijack the name and call them 'pork pithiviers', make them smaller and serve them as a starter with something, perhaps a little black pudding and caramelised apple salad (but that is probably too predictable). Anyway, as you can see, not only does your recipe look very appetizing it also stimulates me to come up with variations of the recipe. Great writing. Gastrogeek did some lamby ones the other day and they looked fab too! This is one of those recipes you just can't make onces: That's to say, after the first time you're hooked.